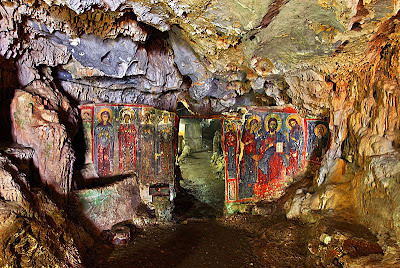 Pictured above are some frescoes from the 13th century Cave Church of Hagia Sophia, inside a cave under the same name, close to Mylopotamos village, on Kythira island. The frescoes are very well preserved because of the great conditions (steady temperature and humidity) inside the cave. There is a newer tiny church of the 19th century, right behind (photo below). Deeper inside the cave, during a tour of about 250 metres (the total lenght of the cave is more than 2.000 metres), you can see some beautiful "halls". 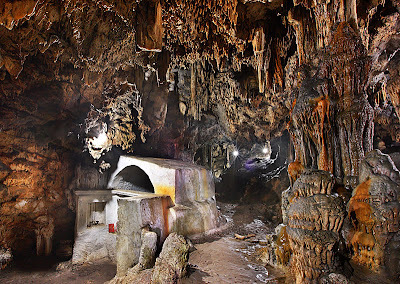 This cave is connected with many legends. They say that this is the exact place where Paris and Helen found their first "love shelter" before leaving for Troy. In one of the halls inside a cave you will see a small lake, called "Aphrodite's bath". Inside the lake you will see hundreds of coins thrown by people who were wishing for better luck in love.